Erin Law is a remarkable woman who shares my passion for bringing together working parents to support each other. She launched SCWAHMS (Sunshine Coast Work At Home Mums) just six months ago, and her website, directory and monthly morning teas have already become a great success. 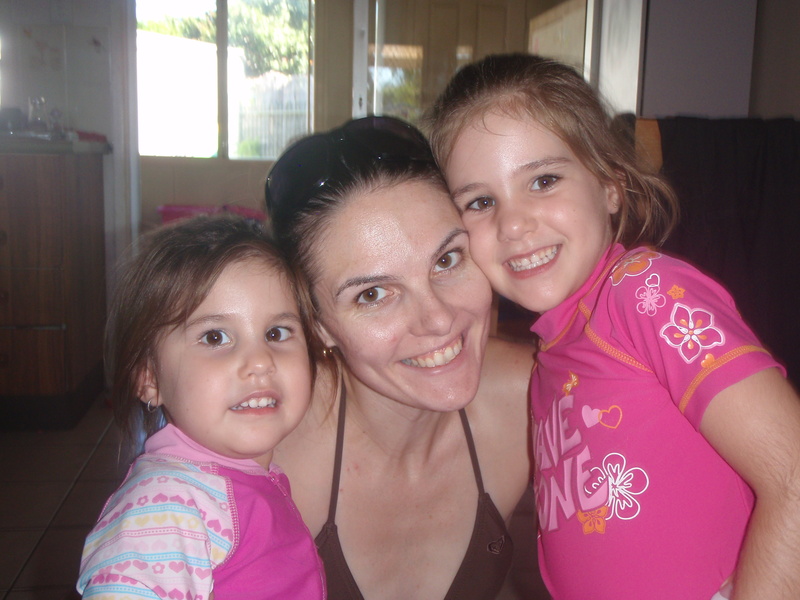 Based in Caloundra and pictured with her two gorgeous girls Cooper (almost 5) and Bailey (almost 3), she is celebrating her 26th birthday next week – happy birthday Erin! I’ve had the pleasure of meeting Erin at a Mamma’s Market (where she had a stand for her “other business “Piccolo Amico and we’ve chatted a few times on Facebook and the phone. I’m very pleased to have the chance to share this interview so you can also get to know this energetic mum better. I particularly love her answer to how many hours she works a week below, and her honesty with the unexpected side of becoming a parent – I’m sure many of us can identify. Here are a few more of Erin’s answers from our email interview…haven’t edited this section as I like how her sense of humour and openness comes across well – and we also share the same enthusiasm in the use of exclamation marks!!! Is this your own business or are you an employee? Mine , mine, all mine! Muahahahah! How did you come to start SCWAHMS? I saw the need for a “one stop shop” to help locals find all the best WAHM businesses, and support them! Worked in Admin in a car yard, but was waiting for my “Mummy Life” to begin! Vast difference, but wouldn’t trade it! Disliking it immensely at times! Approximately how many hours do you work a week? Schedule your time, and try to stick to it! A few of her favourite Professional Parents businesses and products? LOVE LOVE LOVE “Design a Cupcake” Cakes, and “Natural Babycare”’s range of “Sniff This” Bath stuff, Mm Is For Me and La Di Dah Creations. The lovely Donna Hamer from Simple Online Solutions. Erin has also reminded us you can subscribe to the SCWAHMS Newsletter via www.scwahms.com/newsletters.php for the chance to win at $20 credit with the SCWAHMS of your choice. So if you’re a mum in business on the Sunshine Coast and not yet been to her monthly morning teas, make sure you schedule it in. Unfortunately I work in Brisbane on Thursdays and really disappointed I can’t be there myself but certainly looks like a wonderful way to spend a morning and I’ve had great feedback from friends. A huge thanks to Erin for sharing her time, and part of her life with us. Again wishing you a wonderful birthday next week – thanks for all your support of Work at Home Mums. I’m sure you have a bright future ahead! I look forward to networking (and perhaps just coffeeing!) with you in the very near future!! She truly is an inspiration and I am looking forward to see where Erin takes her business in the next 12 months.